NEW YORK, NY, USA, September 14, 2018 /EINPresswire.com/ -- Victor Herbert Renaissance LIVE! Presents Orange Blossoms, his final theatrical score, kicking off its Season of Love, offering his most romantic compositions. 120 West 69th Street, between Broadway and Columbus. Featured in the brilliant score of Orange Blossoms is one of the many opera gems Victor Herbert launched into popular culture, “A Kiss in The Dark.” This song is a very modern examination of the power of a simple kiss to send someone swooning into the heights of true love, and has been recorded by Beverly Sills, Eileen Farrell, and others. This score is filled with surprises and modern touches including neither an Overture nor a Grand Finale. 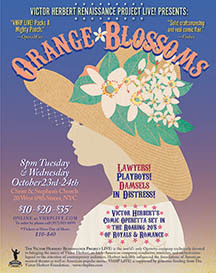 The songs of Orange Blossoms are woven together with a well-written book by Fred (Frederique) DeGresac, a rare female librettist, who also collaborated with Herbert on The Red Mill (1910), The Enchantress (1911) and VHRP LIVE’s upcoming April 2019 performance of Sweethearts (1913). The Irish-American composer Victor Herbert was the "Crown Prince" of American popular music, especially when operetta commanded the early 20th century Broadway stage. Herbert's rhapsodic scores often became instant hits that were published widely and heard from coast to coast. Orange Blossoms presented by VHRP LIVE! includes the voices of Claire Leyden, Bray Wilkins, Sarah Caldwell-Smith, Joanie Brittingham, Drew Bolander, David Seatter, Alexa Devlin, JoAnna Geffert, Susan Case and Jonathan Fox Powers. Specially priced tickets for Orange Blossoms are $10-$35 available online at www.VHRPLIVE.org or at tdf.org up until noon on performance days. The Victor Herbert Renaissance Project LIVE! is the world's only company exclusively devoted to Victor Herbert, the Irish-born conductor and musician who composed innovative scores for early Broadway, as well as classical and popular music. Herbert contributed powerfully to the emergence of an authentically 20th century American sound; and did so lavishly, producing 43 operettas, 2 operas, and innumerable compositions for orchestra, band, cello, violin and piano. Now celebrating its fifth consecutive season in New York City, VHRP LIVE! presents multiple productions annually to the general public at ticket prices ranging from $10 to $40. VHRP LIVE! is a registered 501(c)(3) corporation founded in 2014 by the company’s Artistic Director Alyce Mott, a leading Herbert historian and librettist and Music Director Michael Thomas. In addition, VHRP LIVE! comprises a core group of 25 resident artists, as well as a rotating roster of classically trained singers who perform regularly in well-regarded classical and popular music venues in New York City, nationally and internationally.